The Yorkshire Coast is a great destination for shoppers; not only will you find the big name retailers in our larger resorts, you can enjoy our true USP, the huge number of small, independent shops and businesses, where customer service is unrivaled and nothing is ever too much to ask. Whether you want to completely overhaul your wardrobe at one of our brand name outlet centres, or find a hand-made momento to remind you of your stay here, the Yorkshire Coast is a real treasurebox for anyone seeking a spot of retail therapy. Hornsea Freeport is set amongst attractive landscaped surroundings and with a wide range of factory outlet stores, all offering up to 50% off famous brands, Hornsea Freeport is the perfect place to indulge in some retail therapy. Distilled using the London dry method, with foraged local botanicals from the coast and moorland, our recipe pays homage to Whitby town's rich history. Victoria Richards is an illustrator and designer who works from a barn in rural North Yorkshire. McMillans of Malton is a new local and family ran spirit, wine and beer merchant situated in the 'Food Capital of Yorkshire', Malton. Come and enjoy our locally sourced produce and even pick your own strawberries and raspberries during the season. Enjoy a cup of coffee or tea and delicious homemade cake in our tea rooms. Fantastic light lunches or afternoon teas. Grape Tree is the UK's fastest growing name in healthier eating bringing you the finest natural whole foods at prices, you can afford. The Patisserie Malton opened in early 2011, fronted by local chef Andrew Walker. After turning round the Black Bull at Pickering with his Aunt, Andrew decided to return to his main passion of fine pastry. Northern Ride are the only, North Yorkshire stockist of Olympia, Scapin and Focus bikes; they believe in providing a quality service and these brands will help them achieve that. Interiors at Nine to Eleven store features a showcase of room ideas and home accessories specially selected by owner Sarah Clark. Interiors at Nine to Eleven is sure it will inspire and excite you as you embark on your design journey. 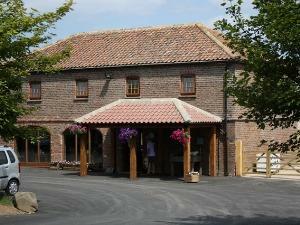 Williams's Farm Kitchen is in the heart of the picturesque shopping outlet village of Hornsea Freeport. The friendly team at William's Farm Kitchen will ensure you taste and enjoy the very best of Yorkshire produce. Gin Distillery – Founded in 2016, we are a working distillery producing our signature Rare Bird Gin, a London dry gin rich in botanicals with a deliciously smooth texture. Bar meals served during the day and an evening menu with a la carte available at night and on Sundays your traditional carvery. Flossies Farm Shop will be supplying mostly fresh and Yorkshire produce for our Holiday Cottage guests and the local community. Welcome to Cedarbarn, where we're passionate about growing, cooking and eating fabulous food! The Green Dragon is passionate about sourcing amazing beers from all around the world. Enjoy perusing over 190 beers in the bottle shop or join us for a delicious pint in our cosy, hidden gem of a tap room. Sally has been baking cakes and pastries here at Glebe Farm for over 30 years and there’s always a great selection on offer, either to accompany a nice cuppa in our adjoining tearoom, or to take away to enjoy at home. The Brunswick Shopping Centre is Scarborough's only shopping centre and is situated in the heart of town centre, just a short walk from the sea front.